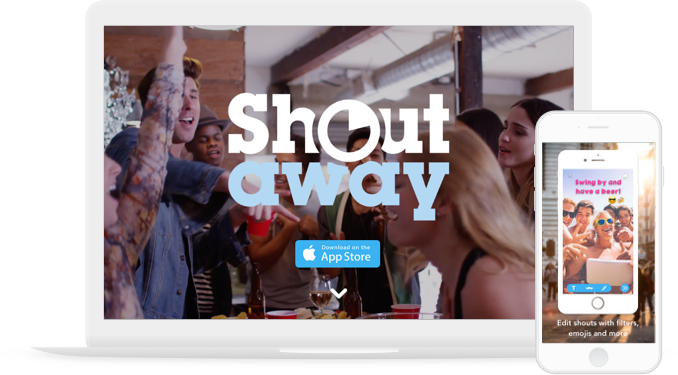 Shoutaway is a location-based mobile app whose client’s system allows the user to make time-limited check-ins, photos and videos called shouts and choose who to share them with. Thus, a selected group of friends, all Facebook friends or everyone in an entire app can see your current position on the map and view your location historу, namely where you have been in the last 24 hours. Sharing the shouts will consequently allow you to keep people informed about places that are worth visiting. The app enables shooting videos of various public events (referred to as shouts) on the fly using a mobile device and immediate showing them to an audience located in the user’s vicinity through a video-streaming platform. The videos that have been shot by the user in succession can be bundled together into themed collections. The video-streaming application utilizes GPS to group videos by the location they originate from and show them to viewers based in or around this location. The app provides a GIS-powered map of the surrounding area, indicating all ongoing shouts. If the user’s current venue, party or other social event does not seem entertaining enough to them, they can watch the shouts and find a more captivating pastime close at hand. A Stockholm-based technology startup was looking for a reliable nearshore development team to take over the development of their innovative video streaming platform. By the time the client approached Vilmate for assistance, they had changed 2 offshore development teams and were extremely unhappy with the results the latter had delivered. While being 90% complete, the client’s system was bug-ridden, hardly usable and unfit to be launched overall. On top of all this, iPhone-shot HD shouts were scarcely watchable or impossible to watch in real time due to their big volume. The client requested us to deal with the existing issues and improve the application’s UX and performance with a tight deadline and a minimum budget. Vilmate started by putting together a project team consisting of 2 part-time software engineers and one QA engineer. The team was managed by a Vilmate Project Manager. In order to improve the performance of the client’s software, the project team had to completely redesign several parts of the application. The main issues that hampered the app’s performance were associated with the time it took videos to be uploaded to the server, as well as the excessively long pause in between two videos within the same shout. This created a user experience that had a severe off-putting effect: the vast majority of users would simply abandon using the software after they had tried doing this for the first time. Our engineers took a custom approach that involved quick video compression and smart asynchronous uploading and successfully resolved the above issues, thereby increasing the system performance on both counts. Another challenge was associated with place finding. To address the issue, we switched from Google Maps API to Foursquare API. The other existing issues that had a negative impact and prevented the system from going live were dealt with by us as efficiently. It has taken the Vilmate team around 1.5 months to render the client’s application fully usable by its target audience. With Vilmate, the client has been able to not only make their product usable, but also to considerably improve its performance cost-effectively, expeditiously and in fine quality.